While I've always enjoyed reading, I did not become the voracious reader I am today until after high school. Up to that point, I'd read a novel or a short story here and there as something caught my attention. Now, I'm never without a book on the nightstand. Honestly, I don't remember what it was that caused the switch to flip, but once it did there was no going back. It was during this first frenzy of reading everything I could get my hands on that I discovered so many great writers. Edgar Rice Burroughs, Ray Bradbury, Richard Matheson, Fredric Brown, Cornell Woolrich, Shirley Jackson . . . and Joe Lansdale. Most I discovered browsing the shelves in the Allen Texas Public Library or at the various Half Price Books in the greater Dallas area I frequented, picking up books at random and seeing what caught my interest. But not Lansdale. I first heard about Champion Joe, of all places, on Dallas's alternative rock station, 102.1 The Edge (R.I.P.). I was working at Guitar Center at the time and a handful of us decided to go out for a late dinner after our shift ended. We decided on the Bennigan's (R.I.P.) off Northwest Highway and the Toll Road. I'd never been and this was before everyone carried around a handy GPS system in their pocket. My buddy Nathan gave me directions and I headed out. For those of you in suspense, I made it there fine, but not before first missing my exit. Not a big deal, except this was the last exit for something ridiculous like five miles. As a result, I was in the car for something like 15-20 minutes longer than I might have been. During that time, I had the radio on to keep me company. Normally The Edge played alt. rock--Nirvana and Green Day and Sublime and Weezer--but for some strange reason that night the D.J. was talking about this crazy new movie called Bubba Ho-Tep, which was playing at The Angelika theater. In it, Elvis Presley is alive and well and living in a rest home in east Texas. He teams up with an African-American man in a wheelchair who may or may not be John F. Kennedy to--wait for it--defeat a mummy that is sucking the souls of the occupants of the rest home. Now, if that doesn't sound like a great movie to you, then we have very different taste in cinema. Don Coscarelli, of Phantasm fame, directed the film, and it was he who was talking to the D.J. In the process of doing so, he mentioned that Bubba Ho-Tep was based on a novella by a Texas writer named Joe R. Lansdale. I committed the name to memory. Anyone who would come up with such a concept was someone whose work I wanted read. Some time later (I don't remember how long, though probably not more than a few days), I ascended the stairs to the fiction section of the library, searching out Mr. Lansdale's work. (I also made it a priority to see Bubba Ho-Tep ASAP, and if you haven't seen it, do yourself a favor.) The library had a handful of Lansdale titles, mostly novels. I'm pretty sure they had The Bottoms and I'd be willing to bet there was at least one Hap and Leonard mystery in there. 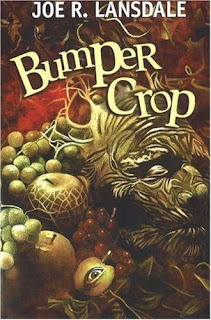 But what drew my eye was a short story collection called Bumper Crop. I'll often start with a writer's short stories when picking up his or her work for the first time. For one thing, I love short stories. And for another, I figure I'll get a wider sense of his or her writing that way. If I happen to pick up a stinker of a novel, I'll have spend hours of time reading it and it may turn me off of said author for some time. But if I run across a bad short story, well, that was twenty minutes of my life I'll never get back, but I can always go on and see if the next one is more to my taste. In the case of Lansdale, I needn't have worried. I've read dozens of novels, short stories, and essays by the guy and I've loved every one. Including all the stories in Bumper Crop. If you like short horror fiction, I can't recommend it highly enough. Recently, I was at ArmadilloCon, in Austin. It's Lansdale's "home-base" convention. He's there, so far as I know, just about every year. Lansdale rents out space in the Dealer's Room, selling books and chatting with folks who drop by. I always make it a point to pay his booth a visit and pick up a couple autographed copies of his books. This year, I picked up High Cotton, another collection of his stories and--you guessed it--Bumper Crop. I'd seen Bumper Crop around in various used bookstores from time to time (sadly, it's out of print, though available as an ebook), but never plunked down the dollars to buy it. I figured I'd already read it and there were other Lansdale titles to spend money on. But when I saw a new-old-stock copy sitting on Lansdale's table, and with the knowledge that he's sign it to me, I went ahead and took the plunge, figuring it would be cool to have a signed copy of the first Joe R. Lansdale book I'd ever read. Let me just say that Bumper Crop is a total time machine, for me. Re-reading the stories contained therein transports me right back to that time when I was first discovering so many great stories, novels, and writers. Reading Bumper Crop is like putting in a mixed tape (or in my generation's case, a burned CD) of all your favorite songs from high school--and they all still hold up! Something I can't say for the actual songs I listen to in high school. In the years since I first read Bumper Crop, I've read thousands of short stories, and in doing so have become, I'll admit, a little jaded. While revisiting Champion Joe's early stories, I'm the guy I was when I first heard that interview on The Edge and couldn't wait to get to the library to check this guy out. A time machine for twenty bucks. Not a bad deal.